It is a great honour to be able to address you today and I regret that I am unable to join you in person and to enjoy the warm and generous hospitality of our host government, Thailand. I am however delighted that CITES is well represented by our good colleague Pia Jonsson. We are most grateful to the Department of National Parks, Wildlife and Plant Conservation of the Ministry of Natural Resources and Environment (MNRE) for hosting this 3rd Regional Dialogue on Preventing Illegal Logging and Trading of Siamese Rosewood. In 1975 when CITES entered into force it regulated trade in 18 timber species. At CITES 16th Conference of the Parties held in Bangkok in 2013 this number grew to over 600 species, including Siamese rosewood (Dalbergia cochinchinensis), which is native to the Indo-China sub region. The success of CITES in supporting legal, sustainable timber trade and addressing illegal trade saw a further 300+ timber species, including all Dalbergia species, being brought under CITES trade controls at CITES CoP17 held in Johannesburg last year. Today over 900 timber species are listed under CITES. The illegal logging and trafficking of Siamese rosewood is causing the serious decline of the species in the wild and damaging the ecological integrity of Southeast Asian forests. According to the first ever World Wildlife Crime Report, which was launched in 2016, 798 metric tons of Siamese Rosewood were seized during 2005-2015. This Report shows the extensive involvement of transnational organized criminal groups in these highly destructive crimes and the pervasive impact of corruption. It demonstrates that combating wildlife crime warrants even greater attention and resources at all levels. Concrete, on the ground, actions are critical if we are to put an end to illegal logging and illegal trade in Siamese Rosewood. At the 2nd Regional Siamese Rosewood Dialogue in April 2016, participating countries all agreed on such countermeasures, with revisions of policy and legal frameworks; strengthened capacity building; enhanced enforcement cooperation; and reducing consumer demand, to be given the highest priority. Success will rely upon source, transit and destination countries taking strong action against organized criminals and stamping out the corruption that enables these highly destructive crimes to occur. Close cooperation with the industry to reduce the demand for illegally traded rosewood, and working with local communities, is critical if we are to promote legitimate livelihood opportunities through legal and sustainable trade in rosewood. Such efforts must be a part of the solution to stopping the illegal trade. The CITES Secretariat is working closely with the International Consortium on Combating Wildlife Crime (ICCWC), a highly effective partnership established in 2010 between the CITES Secretariat, INTERPOL, UNODC, the World Bank and the World Customs Organization, to provide coordinated enforcement support at the national and regional levels to help authorities fight transnational organised criminal groups and defend their natural resources. This includes support to apply the same tools and techniques used to combat other serious crimes – be it the use of modern forensics, enhanced investigation techniques, or tackling money laundering. Efforts are, for example, currently underway to implement the recently launched ICCWC training program on anti-money laundering with a focus on wildlife crime, and to implement the ICCWC Wildlife and Forest Crime Analytic Toolkit in around 20 countries. We have also developed the ICCWC indicator framework on wildlife and forest crime for countries to be able to measure and monitor their enforcement efforts, responses and capacity, as well as the Best Practice Guide on Forensic Timber Identification on forensic best practices and procedures for timber. ICCWC is also providing technical support, such as through the deployment of Wildlife Incident Support Teams (WISTs) to assist, guide and facilitate appropriate follow-up actions in affected countries in the immediate aftermath of a wildlife crime incident, and supporting operations such as the recent Operation Thunderbird, a successful global wildlife law enforcement initiative which resulted in a range of seizures including 60 tonnes of wood and timber. 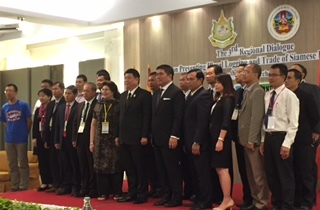 The participants gathered in Bangkok today come from across Siamese rosewood range States and other key countries affected by the illegal trade in rosewood. Together with the participating experts, from both within and outside of government, we have many qualified people assembled in one place for three days to help us review the status of the agreed action points to address these challenges identified at previous Siamese rosewood dialogues in 2014 and 2016, and I do hope you make best use of this unique opportunity. Let me close by again expressing our deep gratitude to the Government of Thailand, and all participating CITES Parties, NGOs, IGOs and experts, for giving the level of attention to halt the illegal trade in Siamese rosewood that it deserves. Thank you once again for the opportunity to address you today.